An extended version of the standard FAST examination (E-FAST) has been established and offers additional information. In addition to imaging of the abdomen, the E-FAST examination includes views of bilateral hemithoraces to assess for hemothorax and views of bilateral upper anterior chest walls to assess for pneumothorax. [14, 15, 16, 17, 18, 19] For the remainder of this article, the FAST examination is referred to as the E-FAST examination, as appropriate. When emergency treatments such as intravenous (IV) fluids or transfusion of blood are indicated, performance of a FAST examination should not delay the initiation of these treatments. Although ongoing resuscitation and a patient in extremis are not contraindications, the FAST examination can be difficult to perform in such situations. For additional resources and education on trauma, see the Trauma Resource Center and Pediatric Abdominal Trauma, Penetrating Abdominal Trauma, Blunt Abdominal Trauma, and Abdominal Vascular Injuries. 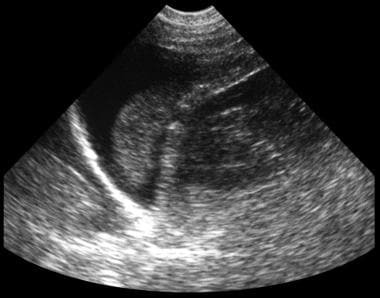 Focused assessment with sonography for trauma (FAST) should include views of (1) the hepatorenal recess (Morison pouch), (2) the perisplenic view, (3) the subxiphoid pericardial window, and (4) the suprapubic window (Douglas pouch). If an extended FAST (E-FAST) examination is performed, views of (1) the bilateral hemithoraces and (2) the upper anterior chest wall should also be obtained. The videos below depict demonstrations of FAST and E-FAST, respectively. Demonstration of focused assessment with sonography for trauma (FAST). Video courtesy of Meghan Kelly Herbst, MD. Also courtesy of Yale School of Medicine, Emergency Medicine. Focused assessment with sonography for trauma (FAST) cardiac extension for E-FAST. Video courtesy of Meghan Kelly Herbst, MD. Also courtesy of Yale School of Medicine, Emergency Medicine. Blood tends to pool in dependent areas. The hepatorenal recess (Morison pouch) is the most dependent space in the supramesocolic region. The suprapubic view allows assessment of fluid in the most dependent area in the inframesocolic region. In women, this space (the rectouterine space) is known as the pouch of Douglas. To visualize the Morison pouch, the transducer-probe should be placed in the right upper quadrant or laterally along the thoracoabdominal junction (see the images below). This placement uses the liver as an acoustic window and avoids interference from air-filled bowel. The probe should be moved toward the inferior margin of the liver to obtain improved images of the right kidney. Probe placement for right upper quadrant laterally. 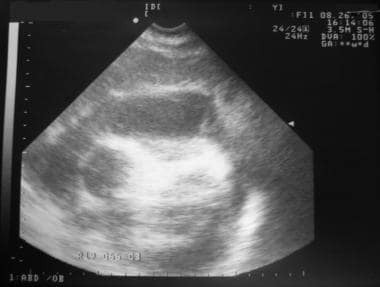 Focused assessment with sonography for trauma (FAST) that depicts fluid in the Morison pouch. Video courtesy of Meghan Kelly Herbst, MD. Also courtesy of Yale School of Medicine, Emergency Medicine. Focused assessment with sonography for trauma (FAST) depicting normal right upper quadrant findings. Video courtesy of Meghan Kelly Herbst, MD. Also courtesy of Yale School of Medicine, Emergency Medicine. 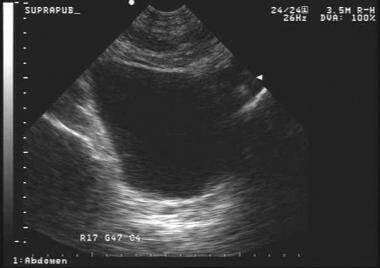 In cases of acute hemoperitoneum, blood appears as an anechoic stripe in the recess (see the image below). Free fluid in Morison pouch. To obtain the perisplenic view, the transducer-probe should be placed over the left flank, lateral to the spleen along the posterior axillary line (see the images below). When placed in this position, the handle of the probe should nearly touch the gurney. This placement allows the spleen to be used as an acoustic window and avoids interference from air-filled bowel. The probe should then be moved superiorly (toward the thoracoabdominal junction) and inferiorly to assess for the presence of free fluid above the spleen and along the spleen tip. Probe placement for left upper quadrant laterally. Be sure to assess the hepatodiaphragmatic and splenodiaphragmatic spaces (see the images below); blood often accumulates in these areas. A common pitfall is to scan only through the hepatorenal and splenorenal spaces. Blood in the splenodiaphragmatic recess. 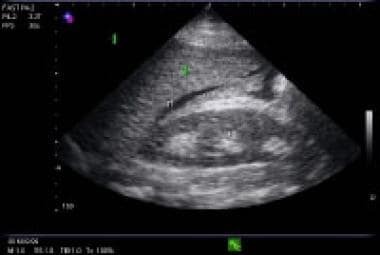 Focused assessment with sonography for trauma (FAST) depicting fluid in the splenorenal space. Video courtesy of Meghan Kelly Herbst, MD. Also courtesy of Yale School of Medicine, Emergency Medicine. 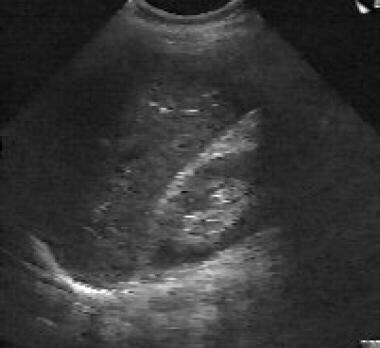 Focused assessment with sonography for trauma (FAST) depicting a normal splenorenal space. Video courtesy of Meghan Kelly Herbst, MD. Also courtesy of Yale School of Medicine, Emergency Medicine. To obtain the suprapubic view, the probe should be placed just above the pubic symphysis and directed inferiorly into the pelvis (see the images below). This view is easier to obtain when the bladder is full and before the placement of a Foley catheter. Be sure to obtain both sagittal and transverse suprapubic views. Focused assessment with sonography for trauma (FAST) depicting fluid in the pelvis, sagittal view. Video courtesy of Meghan Kelly Herbst, MD. Also courtesy of Yale School of Medicine, Emergency Medicine. For the subxiphoid view, the transducer-probe should be placed in the subxiphoid area and directed into the chest toward the left shoulder so as to view the diaphragm and heart (see the images below). This view can be difficult to obtain if the patient is experiencing significant abdominal pain. It often requires pressing the probe into the abdomen and angling the probe so that it is nearly parallel to the skin. In such cases, it is helpful to place the palm over the top of the probe with the thumb on the indicator. Subxiphoid view that demonstrates traumatic tamponade. If the patient is experiencing significant abdominal pain or is obese, consider switching to a parasternal long-axis view. The subxiphoid long-axis view is another view that can be used to assess for pericardial effusions. This view also allows the examiner to assess the size and collapsibility of the inferior vena cava (IVC). If an E-FAST examination is being performed to rule out pneumothorax, place a high-frequency linear probe (8-12 MHz) with the indicator toward the patient’s head in a long-axis orientation. Place the probe high on the patient’s chest, just below the clavicles in the midclavicular line. Look for the pleural line sitting at the back of the ribs. The presence of sliding between the visceral and parietal pleura indicates the absence of a pneumothorax in the area being scanned. The absence of sliding implies the presence of a pneumothorax. See the videos below. Extended focused assessment with sonography for trauma (E-FAST) that shows no pneumothorax. Video courtesy of Meghan Kelly Herbst, MD. Also courtesy of Yale School of Medicine, Emergency Medicine. Extended focused assessment with sonography for trauma (E-FAST) that shows pneumothorax. Video courtesy of Meghan Kelly Herbst, MD. Also courtesy of Yale School of Medicine, Emergency Medicine. If an E-FAST examination is being performed to rule out hemothorax, the transducer probe should be placed laterally on the lower thorax just above the diaphragm. This can be visualized by sliding the probe superiorly from the standard right and left upper quadrant views. Blood appears as an anechoic stripe in the thorax. If rib shadowing is an obstacle, rotate the transducer-probe 30° to fit between the ribs. Consider switching to a probe with a smaller footprint (eg, a phased array probe) if such a device is available. If the desired recesses are difficult to visualize, ask the patient to take a slow, deep breath and, if possible, to hold it. This may move the recess into view. Be sure to fully interrogate each region by scanning through it in its entirety. A single negative view in each region does not constitute a negative E-FAST examination. Hemoperitoneum may take time to accumulate. Maintain a low threshold for repeating the E-FAST examination, especially if the patient’s vital signs or examination change. Serial E-FAST examinations increase the sensitivity with which intraperitoneal free fluid secondary to blunt abdominal trauma can be detected. The E-FAST examination is an excellent initial imaging modality for identifying the presence of hemothorax or pneumothorax in the setting of trauma. Although it is quite specific, it is not sensitive enough to rule out all significant pathology. Anesthesia is generally not necessary for sonographic evaluation. Analgesics may be required for pain control secondary to the particular trauma. Patients should be evaluated in the supine position but may be moved to the Trendelenburg or lateral decubitus position for improved visualization of particular views if there are no contraindications (eg, spinal precautions). Male patients should have the entire abdomen exposed for the examination. Take care with female patients to minimize the exposure of sensitive areas. Typically, no complications are associated with this procedure. No special efforts at complication prevention are required. Jansen JO, Logie JR. Diagnostic peritoneal lavage - an obituary. Br J Surg. 2005 May. 92(5):517-8. [Medline]. Griffin XL, Pullinger R. Are diagnostic peritoneal lavage or focused abdominal sonography for trauma safe screening investigations for hemodynamically stable patients after blunt abdominal trauma? A review of the literature. J Trauma. 2007 Mar. 62(3):779-84. [Medline]. Bahner D, Blaivas M, Cohen HL, Fox JC, Hoffenberg S, Kendall J, et al. AIUM practice guideline for the performance of the focused assessment with sonography for trauma (FAST) examination. J Ultrasound Med. 2008 Feb. 27(2):313-8. [Medline]. Korner M, Krotz MM, Degenhart C, Pfeifer KJ, Reiser MF, Linsenmaier U. Current Role of Emergency US in Patients with Major Trauma. Radiographics. 2008 Jan-Feb. 28(1):225-42. [Medline]. Isenhour JL, Marx J. Advances in abdominal trauma. Emerg Med Clin North Am. 2007 Aug. 25(3):713-33, ix. [Medline]. Savatmongkorngul S, Wongwaisayawan S, Kaewlai R. Focused assessment with sonography for trauma: current perspectives. Open Access Emerg Med. 2017. 9:57-62. [Medline]. Grünherz L, Jensen KO, Neuhaus V, Mica L, Werner CML, Ciritsis B, et al. Early computed tomography or focused assessment with sonography in abdominal trauma: what are the leading opinions?. Eur J Trauma Emerg Surg. 2017 Jul 20. [Medline]. Richards JR, McGahan JP. Focused Assessment with Sonography in Trauma (FAST) in 2017: What Radiologists Can Learn. Radiology. 2017 Apr. 283 (1):30-48. [Medline]. Montoya J, Stawicki SP, Evans DC, Bahner DP, Sparks S, Sharpe RP, et al. From FAST to E-FAST: an overview of the evolution of ultrasound-based traumatic injury assessment. Eur J Trauma Emerg Surg. 2015 Mar 14. [Medline]. Calder BW, Vogel AM, Zhang J, Mauldin PD, et al. Focused assessment with sonography for trauma in children after blunt abdominal trauma: A multi-institutional analysis. J Trauma Acute Care Surg. 2017 Aug. 83 (2):218-224. [Medline]. Helling TS, Wilson J, Augustosky K. The utility of focused abdominal ultrasound in blunt abdominal trauma: a reappraisal. Am J Surg. 2007 Dec. 194(6):728-32; discussion 732-3. [Medline]. Kirkpatrick AW, Sirois M, Laupland KB, Liu D, Rowan K, Ball CG, et al. Hand-held thoracic sonography for detecting post-traumatic pneumothoraces: the Extended Focused Assessment with Sonography for Trauma (EFAST). J Trauma. 2004 Aug. 57(2):288-95. [Medline]. Sheng AY, Dalziel P, Liteplo AS, Fagenholz P, Noble VE. Focused Assessment with Sonography in Trauma and Abdominal Computed Tomography Utilization in Adult Trauma Patients: Trends over the Last Decade. Emerg Med Int. 2013. 2013:678380. [Medline]. [Full Text]. Fuchs PA, del Junco DJ, Fox EE, Holcomb JB, Rahbar MH, Wade CA, et al. Purposeful variable selection and stratification to impute missing Focused Assessment with Sonography for Trauma data in trauma research. J Trauma Acute Care Surg. 2013 Jul. 75(1 Suppl 1):S75-81. [Medline]. [Full Text]. Barbosa RR, Rowell SE, Fox EE, Holcomb JB, Bulger EM, Phelan HA, et al. Increasing time to operation is associated with decreased survival in patients with a positive FAST examination requiring emergent laparotomy. J Trauma Acute Care Surg. 2013 Jul. 75(1 Suppl 1):S48-52. [Medline]. [Full Text]. Bhoi S, Sinha TP, Ramchandani R, Kurrey L, Galwankar S. To determine the accuracy of focused assessment with sonography for trauma done by nonradiologists and its comparative analysis with radiologists in emergency department of a level 1 trauma center of India. J Emerg Trauma Shock. 2013 Jan. 6(1):42-6. [Medline]. [Full Text]. Kärk Nielsen S, Ewertsen C, Svendsen LB, Hillingsø JG, Nielsen MB. 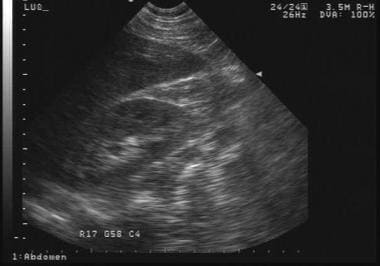 Focused assessment with sonography for trauma in patients with confirmed liver lesions. Scand J Surg. 2012. 101(4):287-91. [Medline]. Matsushima K, Khor D, Berona K, Antoku D, Dollbaum R, Khan M, et al. Double Jeopardy in Penetrating Trauma: Get FAST, Get It Right. World J Surg. 2017 Aug 4. [Medline]. Hussain ZJ, Figueroa R, Budorick NE. How much free fluid can a pregnant patient have? Assessment of pelvic free fluid in pregnant patients without antecedent trauma. J Trauma. 2011 Jun. 70(6):1420-3. [Medline]. Prehospital Ultrasound: Ready for Prime Time?